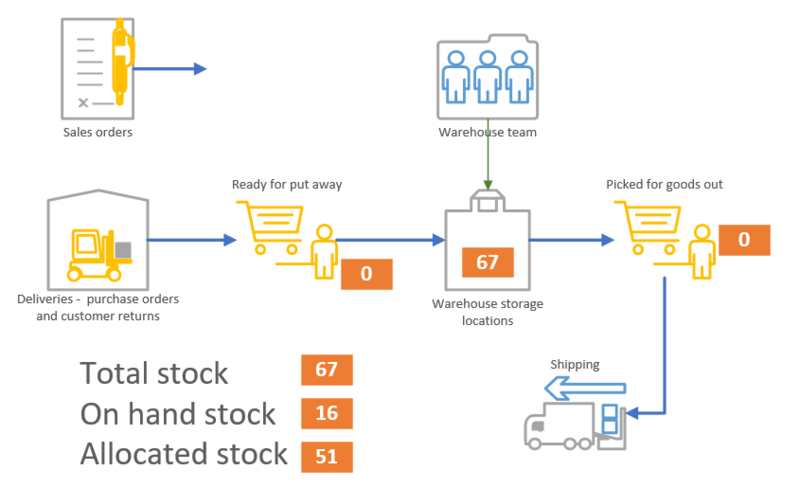 In this posting we look at the sorts of stock count review problems that can occur, how to avoid them and how to solve problems that cannot be avoided. Here we have 55 units of a product at a storage location in the warehouse. 12 of the same product are ready to put away following a delivery and 6 have been picked and are ready to be packed to fulfil sales orders. At this point, the warehouse team have been tasked to count this product. The team will count 55 when in fact there are 73. After updating the channel, the stock count will be wrong by 18. 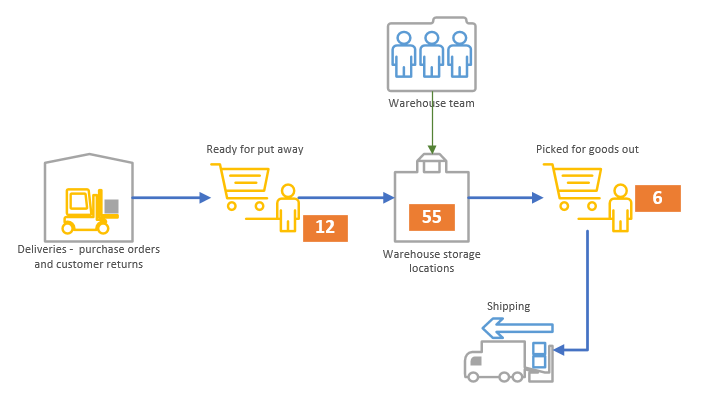 From a practical point of view in most organisations, this makes sense because the warehouse team will stop processing deliveries and goods out to do the count. During the count period, sales orders arrive from your sales channels and inventory is automatically allocated to each order. Going back to our example, we have followed the cardinal rule for stock counting and are now ready to count. The warehouse team open their count instructions in Warewolf and capture location and product barcodes. On completion, they submit their counts for review. The stock count review process compares numbers counted with the number on the stock control channel. Product count lines can be accepted or rejected during the review. Rejected rows are hived off into a separate count batch for further action. Accepted rows update channel stock quantities thereby enabling normal warehouse operations to return to normal quickly. In a well controlled warehouse environment using Warewolf, most lines in counts will match the channel. Happy days. Review will accept without further investigation. 3 more than channel stock counted. Depending on your policy, the reviewer may accept or raise a query. 2 short of expected. Now, the warehouse team may have added a note to the count row. The reviewer might query the difference or accept without further enquiry. Where a note has been made, the reviewer would read it and perhaps find out that 1 or 2 were found to be damaged and unsaleable. Assuming the reviewer accepts, Warewolf will update the channel to a value of 65. Since 65 is enough to cover the 51 allocated, the channel will also accept the adjustment. A big difference but let’s say that the reviewer accepts. Warewolf attempts to update the channel. The channel rejects the update because the final value of 50 would be less than the number already allocated. Clearly a problem and a sales order goods out note will have to be cancelled before Warewolf sends the update again. How should this scenario be handled. Warewolf attempts to update the channel. The channel rejects. Warewolf gives the review a rejection message. From the count listing, find the row and un-tick. Warewolf takes the row out of the count and puts it into a reject batch. Accept the count again. If there are multiple instances, then the same message with a different row will be displayed. When the count is compatible with the channel, Warewolf provides a ‘success’ message.